An early Victorian cottage in Melbourne is given a renovation by rethinking the layout of the traditional footprint. WALTER&WALTER renovated an early Victorian cottage in Melbourne, Australia, by rethinking the traditional layout and concentrating on making the most of every room. 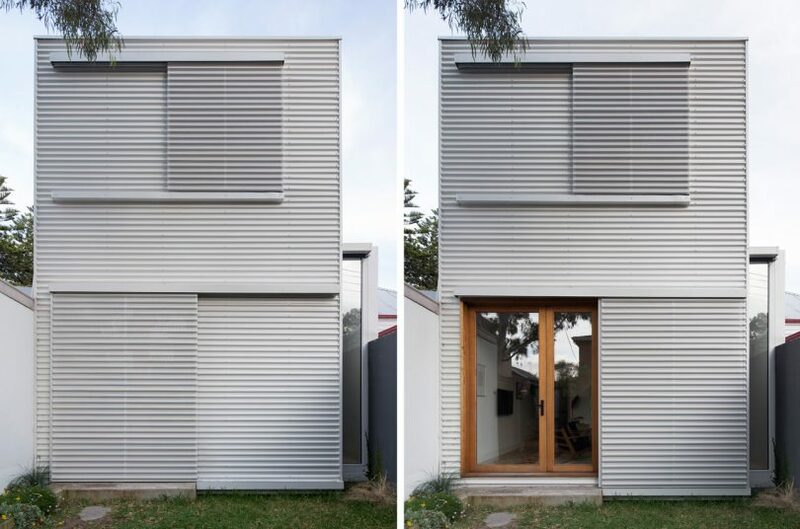 House SE keeps its Victorian facade on the front while getting a new modern rear facade that’s clad in a corrugated and perforated metal. The renovation comprises affordable materials right off the shelf, which helped keep costs and lead times down on the project. The compact footprint resulted in a hallway on one side that connects the rooms but keeps them separate. It also keeps the sight line open from the front door straight through to the back doors. Sliding doors that match the siding close for additional privacy. The perforated sliding doors allow light and fresh air to penetrate the interior while also adding a layer of privacy. The kitchen is kept minimal with subtle wooden cabinets on the lowers and black cabinets against black walls above. A narrow skylight runs along the ceiling on one side bringing natural light to the middle part of the interior, which typically doesn’t get a lot of light. A tall, narrow window on the back of the house mimics the skylight above visually increasing the size of the space. Photos by Ben Hosking, courtesy of BowerBird.